When I have a million things to get done I tend to procrastinate and get a million other things done instead. Which led to the idea that I needed to do this craft this weekend. On Fridays I take my 3 yr old Julia and our neighbor’s daughter Olivia to their violin lessons. 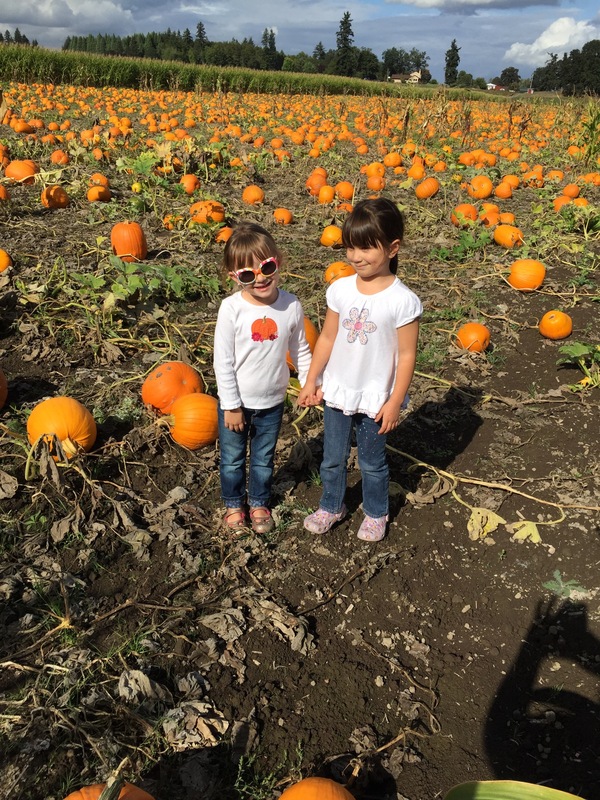 We take a route that goes past the awesome Sauvie Island in Oregon where the farms and pumpkin patches are. Now that fall is here I’ve had the itch to stop there on the way home. There’s no way we could stop and not get pumpkins! 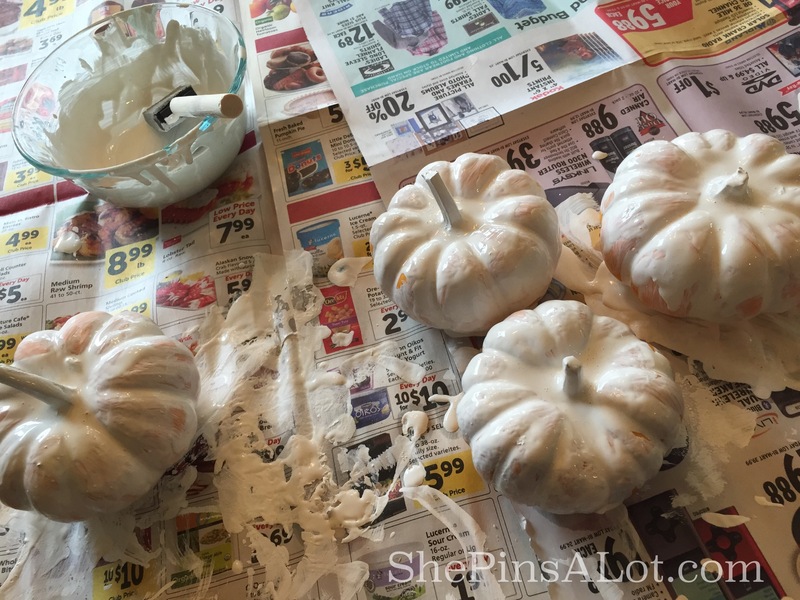 And when you have two little girls with, those white pumpkins are just way too tempting to pass up. The girls were so excited! 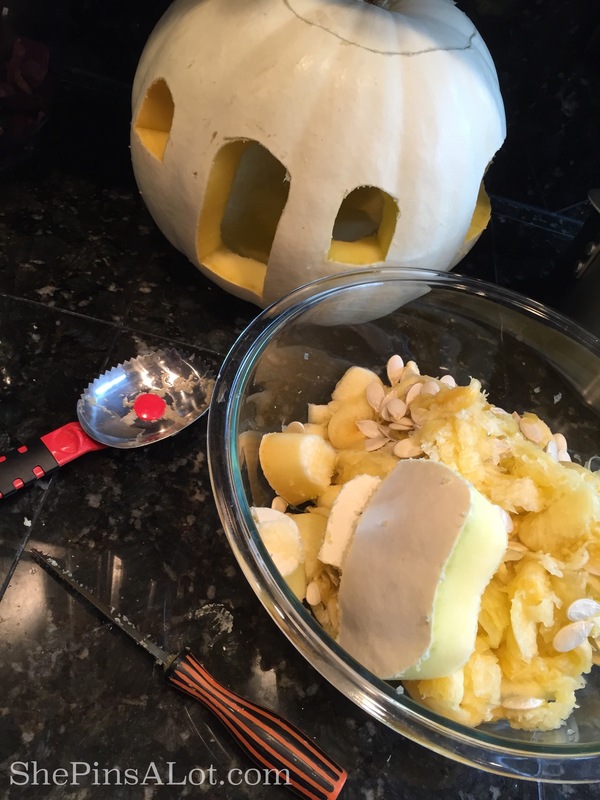 But after a morning of school for Julia and an afternoon of violin lessons and then the pumpkin patch and then the long drive home ( we drive an hour each way ) … I made the wise choice of pushing this craft off until Saturday. 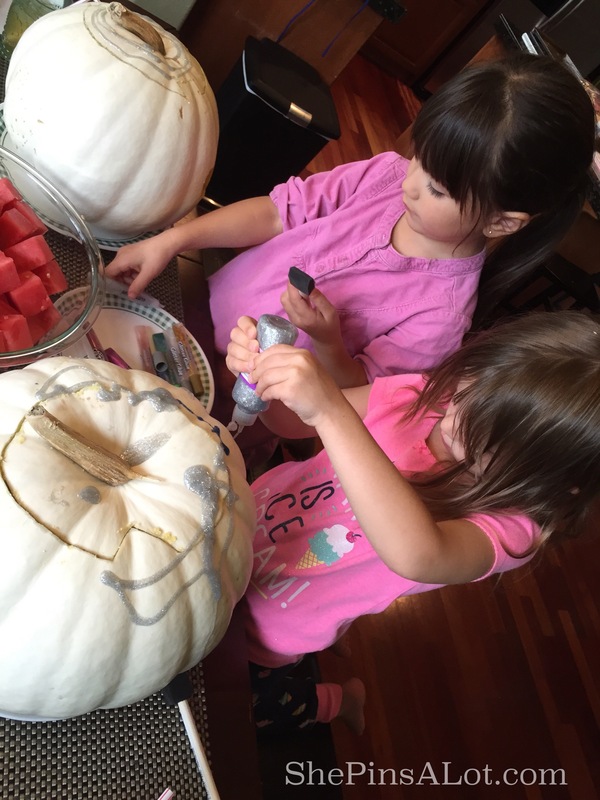 So Saturday morning Olivia popped back over and I dove head first into the task of turning those two pumpkins into Cinderella coaches… Or something of that sort. 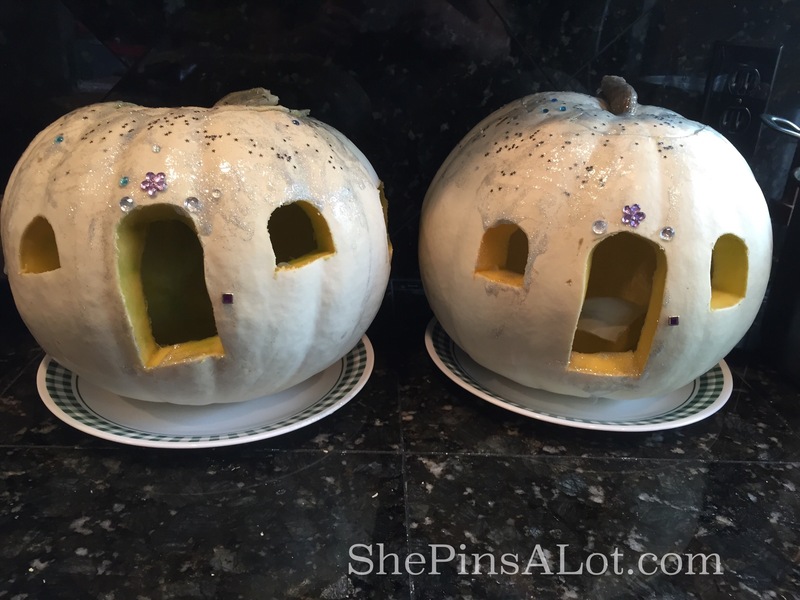 Of course a 3 and 4 yr old are not quite up to the task of cleaning out two big pumpkins so I needed something to occupy them and keep them happy while I did that part. So they got to paint the wheels. I had also picked up eight little pumpkins at the farm just for that purpose. I’m not completely crazy so acrylic paint is what they are using. It cleans up easily with soap and water. While they drenched those suckers in white, I began the carving and cleaning out part. Those white pumpkins smell weird. 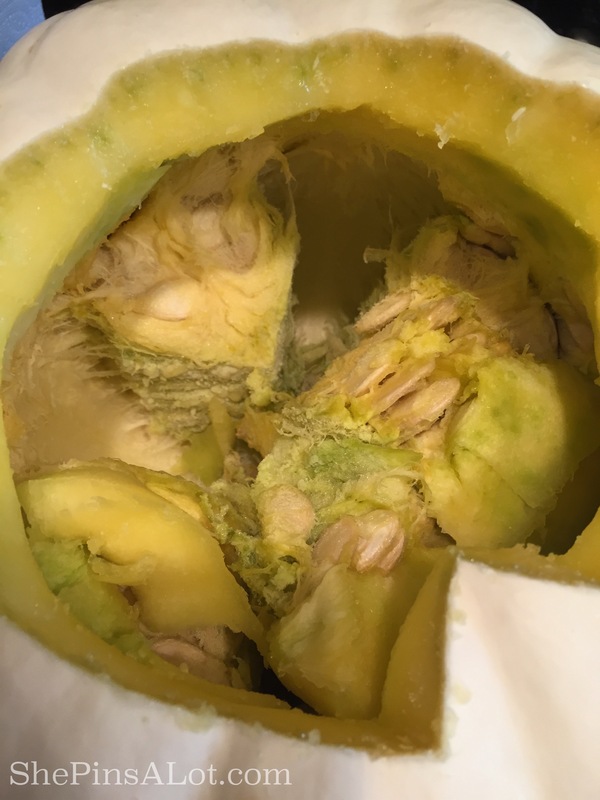 However, after carving Olivia’s up, I discovered something extra stinky lurking inside Julia’s. Hers was moldy! Oh ick!! 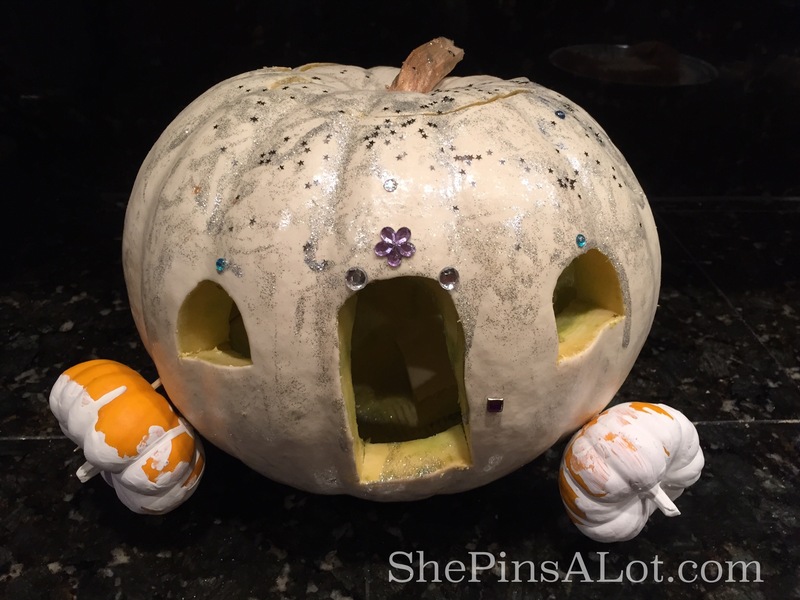 Now of course I couldn’t not carve it as I had to have two pumpkins for two little girls. Like I said, I’m not crazy! Mother of the year am I. I carved that bad boy up and then rinsed it out with bleach. Too bad I couldn’t rinse my eyeballs and nose out too. I did a door in the center with two small windows on each side and then a back end window. I kept the door piece and chopped off the curved end and then used that as a bench inside for Cindy to plop on. All carved up and cleaned out, they were ready for the girls to attack them. I armed them with glitter and gems and set them to task. Piece of advice – make sure your glitter glue sticks aren’t all dried out. Then make sure to have a bottle for each of them of the silver glitter glue so they don’t have to share. Though they did do a very good job of sharing. 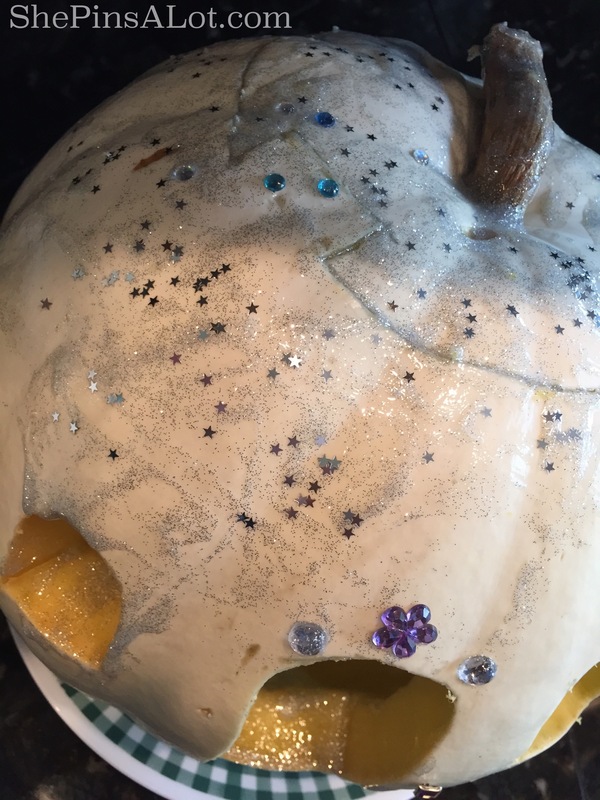 I used a brad shoved into the pumpkin for a door handle and then sprinkled some silver star glitter I had in my stash on top of the globs of silver glitter glue they had painted all over the things. 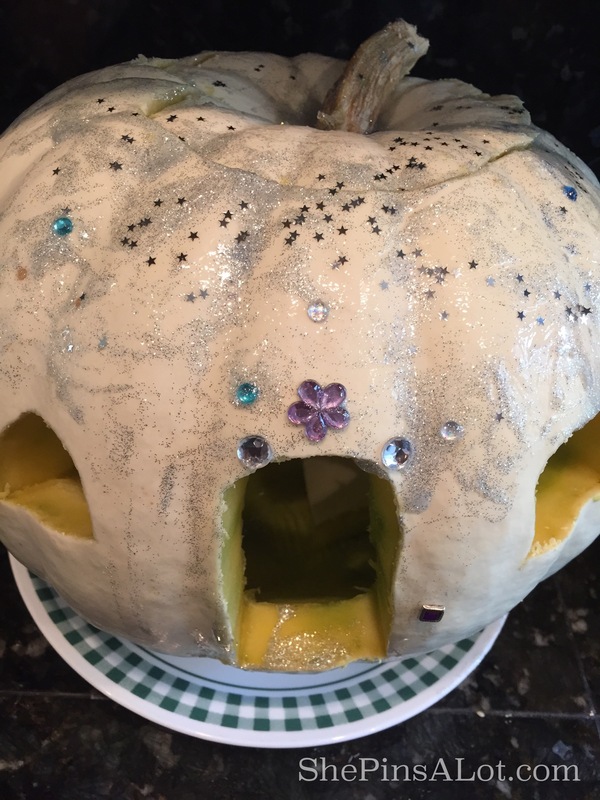 A few gems stuck into the glue and boom – Cinderella eat your heart out! But wait! We needed the wheels! I took wooden skewers and jabbed them into the little pumpkins and then jabbed them into the pumpkins and we were all set! They came out great and I think the girls were thrilled! They loved making them! It was the perfect pumpkin decorating idea for their age. 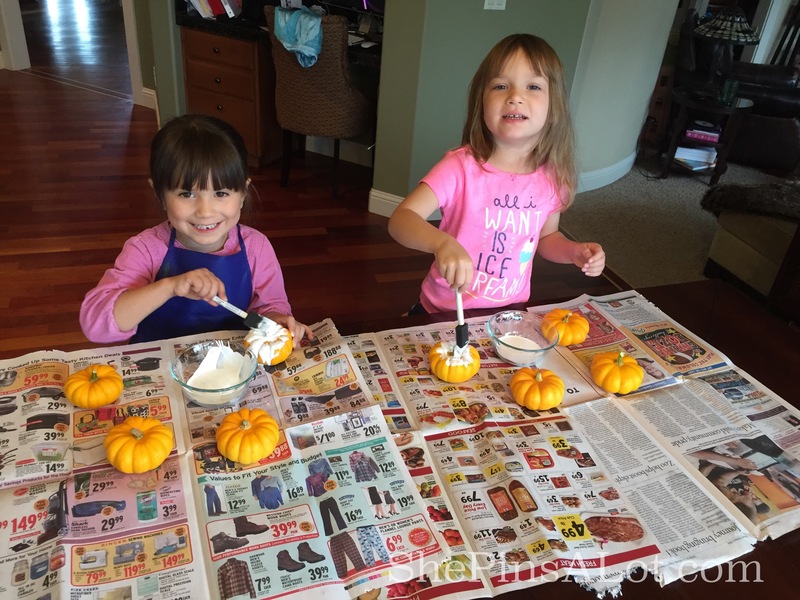 They aren’t quite up to the task of cutting up and carving pumpkins yet so this idea really got them hands on in creating them! 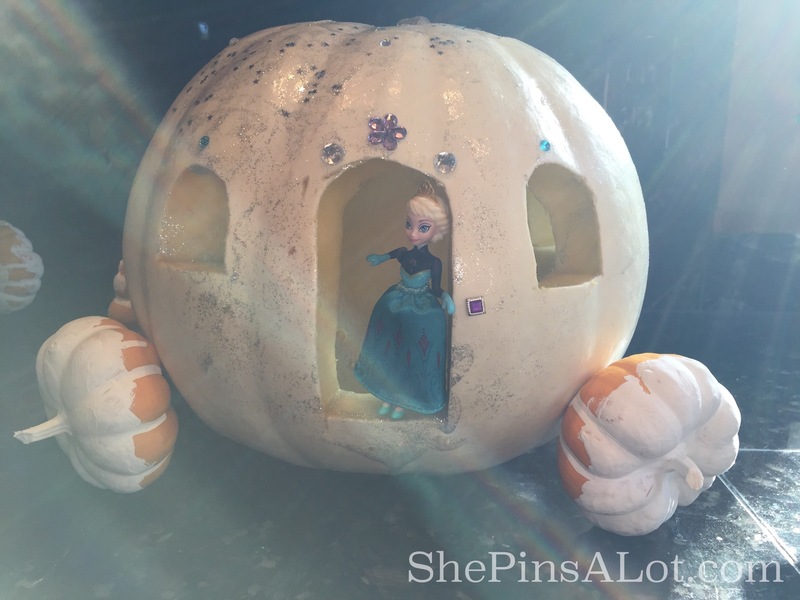 I think these would be a perfect addition to a frozen or princess party too! Either used on the dessert table or as a craft for the girls to do! Thanks for looking! Don’t forget to give my facebook page a like and share with your friends if you enjoyed this! And of course pin away!